Carte des Douze Tribus d'Israel. A beautiful example of Rigobert Bonne's 1783 map of Israel (Palestine / Holy Land) divided according to the Biblical Twelve Tribes of Israel. 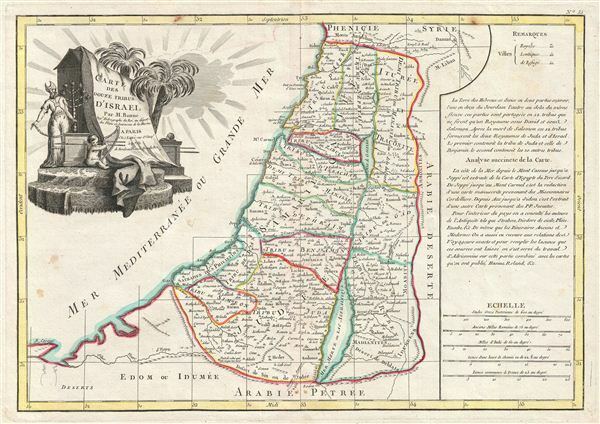 Bonne's map covers Palestine / Israel on both sides of the Jordan River from Sidon to Gaza and Zoara and includes parts of adjacent egypt, Arabia, and Syria (including Damascus). The map is divided according to the Twelve Tribes of Israel, but also includes th Satrapies of the Philistines, what is today the Gaza Strip. The biblical cities of Sodom and Gomorrah, as well as the 'Caverns of Lot' and other Biblical sites are identified. The right hand quadrants feature the map's legend as well as a textual analysis of the map in French. An elaborate decorative title cartouche appears in the upper left quadrant features a high priest holding a candelabrum and a Putto playing the harp. Drawn by Rigobert Bonne 1783 for issue as plate no. 10 in Jean Lattre's 1783 final issue of the Atlas Moderne. Rumsey 2612.080. Phillips (Atlases) 664. National Maritime Museum, 215. British Library, World, col. 384-385 (1762-1785 eds.) Laor, E., Maps of the Holy Land: Cartobibliography of Printed Maps, 1475 - 1900, #120.